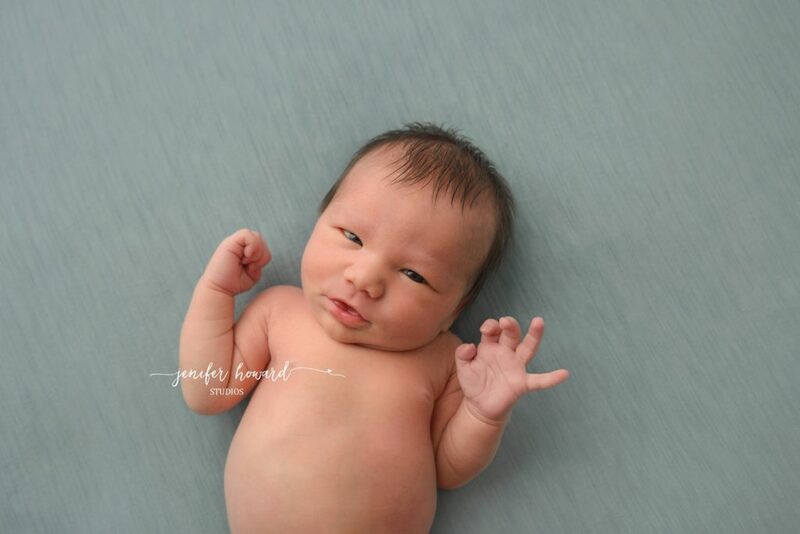 There are some babies that are just ridiculously squishy, and Ethan was one of them. 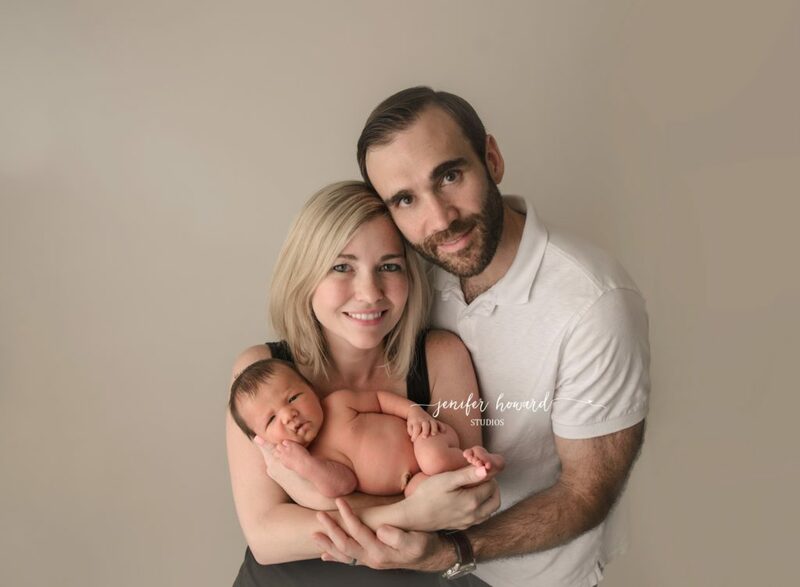 I told his parents that I thought that all of his weight was in his perfect cheeks! They were “cheek-pinching” status, even though he was only around seven and a half pounds! He slept so well for me and just woke up at the end of his session for his family photos! His mom loved some of my favorite props, like my marshmallow tin and vintage water pail. These are just the right size for newborns and really show how teeny they are! I was able to put together some fun color combinations and simple neutral sets for his session, which created a great variety of images for his album! I fell in love with Ethan’s perfect eye contact in this photo! Isn’t it mesmerizing? This cream wrap from Red Owl Photo Props! Well, Hello to you too, sweet boy! Here is another precious capture with Ethan giving me perfect eye contact while his momma snuggled him. I think this is one of my favorite family photos, because Ethan’s adorable big sister needed some kisses too! I cannot even handle his cheeks and those little fingers peeking out! With every sweet newborn client that walks through the door, I am in disbelief that this is my JOB! I absolutely love getting to snuggle and love on these sweet little babies for a few hours and then deliver priceless memories for their parents to keep forever. I am so grateful for all the parents who choose me and trust me to work with their precious newborns. Its not every day that another photographer trusts you to take their photos. I felt honored that April of April Cole Photography based out of Graham, NC trusted me enough to capture these special moments for her. She really wanted to capture their newest addition Parker, with the whole family, which is tough to do by yourself. So we started the session off with family photos. I couldnt believe how well they all posed and how easy they were making my job, then her husband informed me they had been “trained” for photos. That made me giggle a little since for some reason, your own family is the hardest to capture. Children of photographers often suffer from “Photographer’s Child Syndrome”. What is that? Just imagine eye rolls and crying anytime you pull out the camera. We moved quickly through the family portion of the photos and moved onto photos of the star of the session, Baby Parker. He was the sweetest, but had very little interest in sleeping. I was able to capture some of the sweetest little yawns, and some amazing eye contact with this sweet baby boy, before he finally drifted off to sleep. Look at that sweet little face! I loved his cheeks in these two photos! This adorable bear hat is from Mokumba Baby Props, and they are amazing! Do you see those sweet little toes peeking out of the wool fluff!? OK, Maybe I’m a little tired. How sweet is this image of April and Baby Parker! 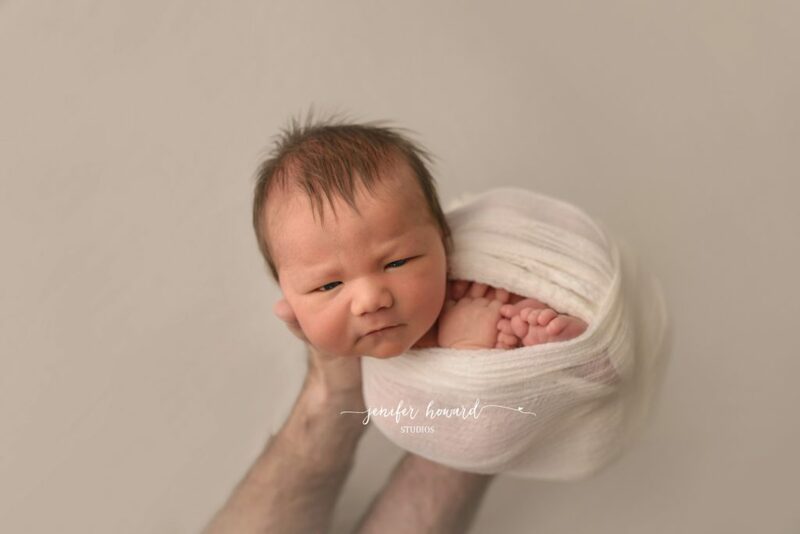 It is definitely one of my favorite mama and newborn photos! See, I told you they were just perfect! Six Months Old is such a fun age to capture! It has always been one of my favorites ages because they can sit up by themselves, give you HUGE gummy grins, are happy to see everybody, and have just the perfect amount of baby squish on them! Their little personalities are really starting to show through and they definitely have an opinion about what is going on. One of the best parts is that they cannot move yet (usually, Ill get an early crawler on occasion)! Freya was an absolute doll for her session. I absolutely loved her big blue mesmerizing eyes and dark brown hair! Her mom asked for some simple set ups, so I stuck with creams with a few pops of color for one of the sets! The blue headband really made her blue eyes pop! I pulled out some pearls for a few of her images and she was obsessed with them! We ended hersession in a simple cream dress, and it was just the perfect amount of dainty for this sweet baby girl! This was one of the first photos that I took of Freya, just look at those beautiful blue eyes! Isnt that the best smile you have ever seen? I LOVED this and a few other headbands from Edna Magdalene! I love her headbands because they are so elegant and chic! Meet Baby Amaya! She was such a teeny little thing at just 5.5 lbs, but such a sweet snuggle bug! Amaya’s mom contacted me a couple weeks before her due date to start planning her session. She had ordered some gorgeous headbands and bracelets that she wanted to incorporate into the session. The colors were perfect and I was able to create some beautiful sets that flowed seamlessly with the accessories, while adding in a few of my own for variation. I traveled to their home for this session, and it was an extra special treat to have lots of Amaya’s extended family present. There was a lot of “oooh’ing” and “ahhh’ing” when one of her grandma’s would peek over to see! One of my favorite parts of newborn sessions is the planning. I usually sit in my studio before each session and put together different combos of props, layers, and accessories to see what works the best together. Maximizing each prop with different accessories is key to getting more variety of images! The studio is constantly getting new props, wraps, and accessories. New props keep my creative juices flowing and of course, shopping = fun! We may have had to offer Amaya’s adorable brother some cookies in exchange for some photos. This sweet photo made it worth it! I love her somber look here! It was one of the first shots I took and it was just so perfect! Check out this adorable this little smile while looking at her mom! I could not have done this session without all the gorgeous Red Owl Wraps, they are absolutely incredible! Imagine in 20 years you are going through your old photo albums from when your children were young. You come across a photo that makes your heart beat faster and tears start to flow. Your sweet little ones doing one of their cute, quirky little things that really show off their personality. You remember how shy they were at that age, or how expressive they were with there hands. Maybe every time something was good or awesome, they gave you two thumbs up. All of those sweet memories come flooding back in an instant from just ONE photo. I know, that getting that perfect portrait is important. You know the one, where everyone is looking and smiling! I have discovered though, that the more FUN you have during your photo session, the more real emotion you get! Sometimes it requires everyone singing “Let It Go”, playing peek a boo or tag, or having a big family cuddle. The goal of each session is to capture just that! I loved working with these three gorgeous kiddos! Of course, I am slightly biased since I am their aunt! When my Sister In Law asked me to take a couple portraits so she could update her walls I was more than happy to get these cuties in front of the camera! I don’t have many nieces, so to get to photograph and play with two of them was extra special! Arlie Mae was a doll! Everytime I see her, I cant get enough of her gorgeous curls! Then of course there is Case, who is as silly as they come! I cant believe how big he is now! Then lastly, sweet baby Annie! I mean, c’mon. Can you even handle all of her cuteness?!? !